The U.S. Patent and Trademark Office on Thursday published a somewhat unusual Apple invention detailing a communications platform that ditches cellular in favor of direct, point-to-point network technology. Apple's patent application for "Point-to-point ad hoc voice communication" describes a mode of communication much more intimate —and less ambitious in function —than the company's iPhone product line. Specifically, the invention outlines a headset capable of connecting with other devices of the same type via wireless ad hoc networks, also known as peer-to-peer or point-to-point links. Packed with a typical assortment of audio hardware including a microphone and speaker, Apple's proposed headset also features a communications module that allows it to interface with other units in close proximity. In some embodiments, the headset might also connect via Lightning or 3.5mm jack to a mobile device, opening the door to app-driven solutions. Such device setups are identical or closely related to currently shipping stereo headphones with built-in microphone and remote control modules, Apple's gratis EarPods being a valid example. Interestingly, Apple eschews support for distributed communications networks like cellular and satellite, instead opting for direct wireless connections facilitated through Wi-Fi, Bluetooth or other similar protocol. Less functional than a cell network, cutting out intermediary hops does have its advantages, the most apparent being extremely low-latency communications. Further, users in some scenarios would be better served by a direct, low-latency connection. For example, two friends talking to each other in a noisy room would experience a temporal discord between audio signals if relying on their cellphones. It's these situations, when users are close enough to see each other's body gestures, that direct ad hoc communications are preferable, Apple says. A variety of ideal systems are referenced in today's exhaustive patent application —drafted by an engineer who previously worked for German audio giant Sennheiser —but the document consistently returns to an embodiment best described as a greatly enhanced walkie-talkie. Using a combination of modern wireless technology, advanced hardware and complex software, Apple is able to revitalize a decades-old idea. For example, the proposed system might present a GUI on a connected touchscreen-enabled device to indicate nearby users with whom a direct link can be established. Tapping on a user icon is a marked improvement over dialing a phone number or browsing through a stored contacts list. A digital communications suite provides enhancements like signal encryption and multi-user conference calling. Ambient noise can also be filtered out through the application of specialized software. As with all Apple patents, it's not clear whether the company plans to implement such technology into a shipping product anytime soon. However, aside from the obvious iOS device use case, the ad hoc system would be a good fit for Apple's own Apple Stores, who currently use traditional two-way radios to facilitate communication between floor staff and those working back of store. 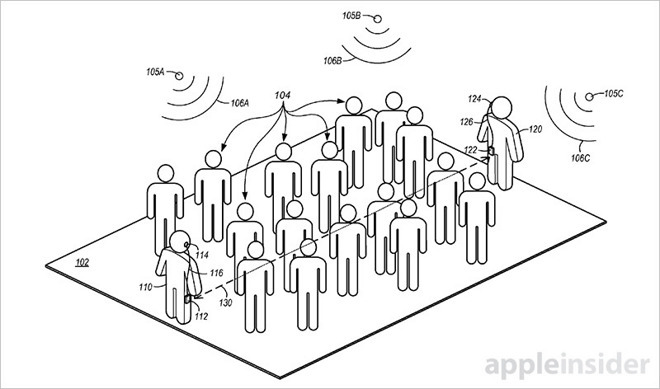 Apple's advanced walkie-talkie patent application was first filed for in November 2014 and credits Esge B. Andersen and Cedrik Bacon as its inventors.